In 2012, physicists at the Large Hadron Collider announced the detection of the Higgs Boson, an elementary particle that helped to fill in pieces of the Standard Model. Physicists are still hunting for exotic particles that could lead to a new physics framework. Physicists Janet Conrad and James Beacham take us on a tour of sterile neutrinos, gravitons, and axions, and discuss how the particles could shed light on dark matter. James Beacham is a Post-doctoral Research Fellow with the ATLAS Experiment at CERN. He’s part of The Ohio State University, but based in Geneva, Switzerland. Janet Conrad is a Professor of Physics at the Massachusetts Institute of Technology in Cambridge, Massachusetts. IRA FLATOW: This is Science Friday. I’m Ira Flatow. For you physics geeks, July 4, 2012 is a special day. Because on that day two years ago– four years ago I should say, scientists at the LHC announced they had observed the Higgs boson. The hunt lasted nearly half a century, but the Higgs was only the tease. It filled in a big piece of the puzzle of understanding the universe, but gaping holes remain to be filled in the particle zoo. And this week teams of particle hunters, one from the large Hadron Collider in Geneva, and the other from the Ice Cube Neutrino Detector in Antarctica reported that no, they have not found signs of any new particle. Hm, bummer. But the search continues. What exact particles are physicists looking for and why? James Beacham is a post-doctoral researcher at The Ohio State University. He’s also part of the Atlas team at CERN. He joins us from Geneva, Switzerland. Welcome to Science Friday. JAMES BEACHAM: Hi. Thanks. My pleasure. IRA FLATOW: Janet Conrad is a professor of physics at MIT in Cambridge, Massachusetts. Welcome to you, Dr. Conrad. JANET CONRAD: Hi. Thank you very much. I’m pleased to be here. IRA FLATOW: And if you don’t know a neutron from a neutrino, we’d like to hear from you. Our number, 844-724-8255. 844-SCITALK, or tweet us at SciFri. Dr. Beacham, we have spotted the Higgs again after that first finding, haven’t we? JAMES BEACHAM: Indeed, we have. It’s one of the biggest successes of the last round of results that we released at this big conference last week. We did rediscover the Higgs. So this is fantastic news. IRA FLATOW: So that got a lot of folks at LHC excited about possibly finding some new stuff. This little bumplet they talked about that turned out not to be a new particle. JAMES BEACHAM: Well, yeah. In fact it’s been a bit of a whirl wind few months because of that little bumplet. But yeah, so that got a lot of attention in the press. The Higgs discovery is somewhat distinct from that. But this little diphoton bumplet– it was a suggested hint of new physics that we announced back in December of last year. It turned out that at the time we pointed out this is not so statistically significant. A little bump, bumps like this come and go in our field, but the kind of suggested thing about it was that– well us and the [INAUDIBLE] experiment, and the CMS experiment, we kind of roughly saw the same little bumplet at about the same place. So the theory maybe sort of ran with that, and the news got in on the subject. And so this was the topic of a lot of attention. And so then we took about five times more data this year. And it turned out that the little slightly meso-suggestive bumplet turned into a nice smooth black. So that’s no new physics there, but it’s been a whirl wind few months. IRA FLATOW: Doctor Conrad, you call yourself an anomaly hunter. And you specialize in neutrinos. But the neutrino is accounted for. I mean why is the neutrino really interesting? JANET CONRAD: So the neutrino is one of the only standard model particles that has actually been behaving differently from the way that we actually predict particles should behave in the standard model. And we’ve already seen it behaved differently. We have seen that neutrinos have mass when the standard model says that neutrinos should not have mass. So that leaves you to start asking what other kind of beyond standard model properties would neutrinos have? And so that’s why they’re so interesting. IRA FLATOW: And just briefly, the standard model is the model that physicists accept to how the universe is made, and all the particle zoo in it? JANET CONRAD: That’s right. It’s what describes the little particle zoo, but it’s a model, not a theory. In the sense that we have to give it a lot of inputs in order for it to be predictive for our science. And we have to go out and measure those inputs. They’re not coming from first principles. And so that’s why we call it a model, and why we think that there’s a larger theory behind it. IRA FLATOW: Ah, very good. So that’s a great explanation. The Ice Cube Detector that’s in Antarctica, correct? JANET CONRAD: That’s right, but I’ve never been to Antarctica. IRA FLATOW: I won’t brag. I won’t brag that I have. JANET CONRAD: It runs on its own, and then it sends the data back to us for analysis. IRA FLATOW: Well, it did not find– it announced that it did not find any sterile neutrinos. Now what is a sterile neutrino? What were they looking for? JANET CONRAD: The sterile neutrino is a cousin that we think would exist to the existing neutrino. So theories say that there should be sterile neutrinos. And they give us a little bit of an idea of what those neutrinos should look like in our data. And so we go out and we try to look and see if we can see those features. And so it’s kind of like if you were an explorer, and you went out to a new world, and you were looking for an animal. And you were told that animal is going to have one blue eye and one brown eye. And you go out and you look, and what we’ve seen in neutrino physics is flashes of blue eyes as we look around, but we’ve never seen the brown eye. And what Ice Cube did was a very thorough survey of this area, and to try to understand if we ever see a brown eye in that area of parameter space. We never do. So this either means our sterile neutrino doesn’t look like what we thought, our sterile neutrino knows how to hide its brown eye, or it’s an anomaly that, like the little blip that was being discussed earlier, may actually go away. IRA FLATOW: With all this esoteric dark matter that we don’t know what it’s made out of, could this sterile neutrino be a candidate for some of this stuff? JANET CONRAD: Oh, yes. Sterile neutrinos are definitely a candidate for dark matter. The favorite candidate for dark matter comes and goes in my field. But right now sterile neutrinos are ones that people are definitely considering. The sterile neutrino that we were looking for in Ice Cube, it has a little bit less mass than the sterile neutrino that people talk about for dark matter, but they would all be a related family. IRA FLATOW: Uh-huh. And so you’re not talking about the WIMPs. You’re talking about neutrino here. JANET CONRAD: That’s right. A WIMP is something different. A WIMP is actually something which people usually associate– well first of all, a WIMP is pretty heavy. And it’s also something people usually associate with supersymmetry. And the sterile neutrinos are a completely different way of asking about dark matter. Because we haven’t seen the WIMPs that we were looking for, we need to start thinking out of the box on dark matter. And this is one way to do it. IRA FLATOW: All right. Let’s think out of the blocks on the phones. Our number 844-724-8255. Let’s go to Deer Park, New York. Mark, hi. Welcome to Science Friday. MARK: Hi. I appreciate you guys taking the call. MARK: I have a quick question. I remember watching documentaries in astronomy and physics about neutrinos, and not really understanding it much. But I got a quick question. Do neutrinos take up space? Like so for instance, if you could put a million neutrinos in a jar, would you be able to put more stuff in there, or is it like light? I’ve never kind of– sorry. IRA FLATOW: What are these? JAMES BEACHAM: Well, in a basic sense, the standard model is the description of the very, very small. Like Janet was pointing out with neutrinos. And each one of these particles has a different m, and a different mass. But this mass is not the same thing that we think of in terms of like a massive bouncer at a bar or something. The mass is sort of like a number that Mother Nature puts there for us. And so these particles are point particles to the best description that we have. And so they don’t take up space, per se. They have other properties, but they don’t take up the spatial extent. So you can put a large number of neutrinos in a jar. IRA FLATOW: So we would have a million neutrinos going right through us now, sitting here. JAMES BEACHAM: Probably more than that. JANET CONRAD: A lot more than that. JAMES BEACHAM: Yeah, and in fact as Janet pointed out, we have a lot more neutrinos passing through our body right now, every second. We also, by some estimates, we have something like billions of particles of dark matter also coursing through our body right now. And this would be some of these wind hypotheses and some other related out of the box hypotheses. So there’s a lot of stuff going through us right now that we don’t necessarily– it’s not interacting with us. So no spatial extent in that respect. IRA FLATOW: Speaking of a lot of stuff, Doctor Beacham, what exotic particles do you think could be floating out there in the universe that maybe the LHC could find, or maybe we need a bigger machine? JAMES BEACHAM: Well, that’s a really good question. What I think doesn’t really matter. Mother Nature chooses for us. And our job as explorers is to go and look for it. So the things that we’re looking for at, and we’re sensitive to at the LHC for instance, we can’t actually look for dark matter particles. We can’t directly detect them because they’re dark. And they don’t interact with our standard apparatus. And so we have to detect them in indirect ways. But yeah, dark matter is something that we look for at the LHC. We’re also looking for things like exotic cousins, heavy cousins of the Higgs boson. And we’re also looking for things like gravitons. And this would be a hypothetical particle of gravity, which we’ve never– which has been theorized for a very long time, but we’ve never seen any evidence of. IRA FLATOW: Janet Conrad, you’re working on a liquid argon neutrino experiment. How would this work differently than the other neutrino detectors? JANET CONRAD: So this is a new state of the art technology. And it’s 170 tons of liquid argon. Liquid argon is about very close to the same temperature as liquid nitrogen. So it’s a cryogenic experiment. And the reason why you use it is because you can actually get exquisitely images from a detector like this. So it is almost like you’re looking at a photograph of the neutrino interaction as it occurs. It’s very exciting. It is also very state of the art. And so we are in the process of trying to bring up our detector now. The first big one, the really large one to be built in the United States, is Microboone, which is running at Fermilab. IRA FLATOW: Let’s go to the phones. A lot of questions here coming. Let’s go to Savannah, Georgia. Hi, Mitchell. MITCHELL: Hello. How are you today? MITCHELL: Yes, I was curious I’ve heard a lot of talk about the LHC recently and other super colliders all around the world. And many scientists such as like Stephen Hawking and others have come out and said that it’s very dangerous. And you’re basically playing with fire. How do we know that these are actually safe and they’re not affecting our weather, or our electromagnetic sphere that we have? The magnetosphere around the earth? IRA FLATOW: James? Janet? Who’d like to tackle that one? JAMES BEACHAM: Well, I can speak for the LHC. The notion of the LHC, we talk a lot about how we are exploring the unknown here with this highest energy ever. And that highest energy ever is something called 13 TEV, trillion electron volts. And this really is the highest energy we’ve used in a collider experiment. However, this is not the highest energy by any stretch of the imagination of even things that happen nearby us on the globe. So for instance, there are particle collisions that happen in the upper atmosphere from incoming cosmic rays that are thousands of times more energetic than our collider experiment. The whole point of our collider experiment is that you take protons, and you accelerate them up to almost the speed of light to this 13 TEV. And then under very controlled conditions in a laboratory, you have a beam where you collide those, like at 40 million times a second, or something like that. So the energies that we’re actually using for a single proton at such high energy– it is impressive in terms of laboratory, and pushing into the scientific unknown. But it’s actually the kinetic energy of like a mosquito. So it’s not such a big deal. 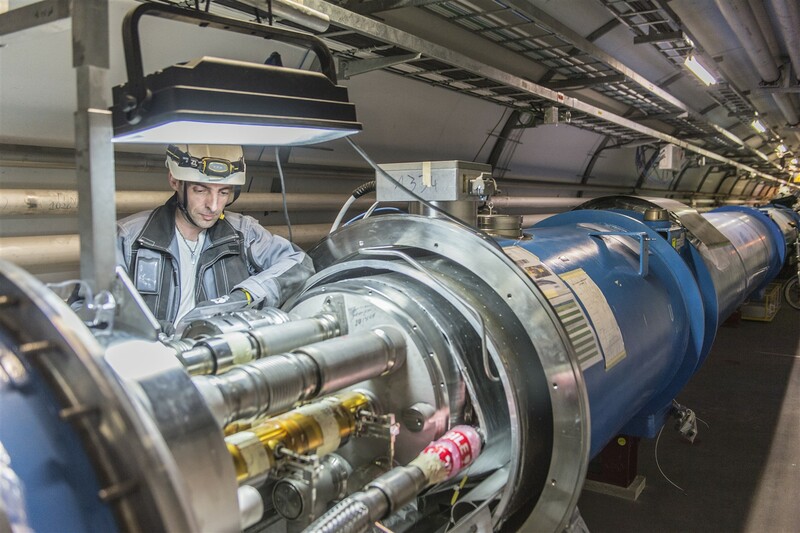 In the magnetic fields that we use in these magnets, we do have to keep our magnets in the LHC tunnel. We have to keep them at very, very cold temperatures. Actually colder than outer space so that we can bend these protons. But the magnetic fields they are using are really, really insubstantial compared to the larger ones. So it’s an extremely remote possibility that we’re affecting weather patterns. And no one’s ever seen any evidence for it. So I think you’re OK.
IRA FLATOW: Let’s go to Steve in Killingworth, Connecticut. Hi, Steve. STEVE: Hi. Got a situation for you and a question. Suppose I was going to study a muon ball, and it was in this dark room. And the way I decided to study it was to shoot another bowling ball at it and bust it all apart. The only thing I could look at was the remnants of the pieces of this bowling ball that blew apart. Wouldn’t that give me a rather strange interpretation of what the bowling ball was? And my question is, isn’t there any other way to study these minutes particles and waves and energy than blowing them apart? IRA FLATOW: Let me get Janet to answer that first. Janet? JANET CONRAD: I think that’s a perfect analogy. An example that I like to use is actually that you hit an egg. So you throw a BB at an egg, and you blow the egg apart. Would you then be able to reconstruct that back into what an egg actually looks like? We’ve had to work really hard in order to be able to understand how to go backwards and put together the picture. So there’s ways that we can do this. We can hit it with a lot of different things and understand how the debris behaves. But unfortunately when you get down to these very, very tiny scales, you really have to blow things apart in order to be able to really understand what’s going on inside of them. And we haven’t found a way around that. IRA FLATOW: Is it more exciting to find what you’re looking for, or to find something that you’re not looking for? JANET CONRAD: To be honest with you, for me, I’m really excited about this Ice Cube result because it was not actually what we expected. And it’s very hard to put this together with the other data that’s out there that says that we should be seeing sterile neutrinos. So I see this as a real opportunity to go on another expedition. So I am really happy about it. I realize that it’s hard to explain that to the world. But it clearly is a great thing to find the thing you were looking for. And so the folks at LHC, I can’t imagine how excited they were when they saw the Higgs. It has to have been great. IRA FLATOW: This is Science Friday from– let me just interrupt rudely. This is Science Friday from PRI, Public Radio International. OK, James. Go ahead. JAMES BEACHAM: Yeah, I was just going to say I totally agree. And we were over the moon when we discovered the Higgs boson. But this was the last remaining piece of the standard model to plug in. This puzzle piece. And beyond that, anything we find beyond that is going to be completely revolutionary because it will be the first evidence that we’ve seen of a fundamental particle outside of this wildly successful standard model. And so it’s a really good example to have both of these experiments on at the same time. Because we both publish kind of null results, in a sense, at around the same time. And the message from the LHC last week was not so much that just this little diphoton bumplet faded away. It was more that we have just recorder our first initial findings at this kind of– I think of it as like an alien planet. 13 TEV, we don’t know what we’re going to find. We have probably two decades worth of research to do on this data. And we just barely got here. So it’s like our job to report back to home base in a sense. If we go to an alien planet, we look around, very instantly see if there are any big, fuzzy, easy to spot monsters. We don’t see those. And so we don’t disappear immediately. What we do is we spend the next decade to two decades combing through the sand trying to find the hidden stuff that could be there. So for me, what this demonstrates is that we didn’t see any easy obvious to spot particles, so this motivates the next 10 to 20 years of research. And then possibly a larger collider in the future. IRA FLATOW: Janet, there is a group I understand looking for milli-charged particles with lasers. Tell us what that is. JANET CONRAD: Oh, yeah. This is a very interesting piece of work, which is being done a lot out of Stanford. And this group is looking for particles. So at the moment, all of the particles that we know of have integral charge. They have 0 charge or one charge, or maybe two or more. But they don’t have fractional charge that we are able to actually see in the outside world. So these people are looking for milli-charged particles. They take a little balls and they balance them on laser beams. And if you have a tiny little extra bit of electric charge on them, it would cause the balance to be off. And so they can actually search for this. So it’s neat. It’s tabletop physics, literally. It’s on a laser table that is addressing questions that are really high energy scale questions in physics. IRA FLATOW: Wow. We’ll have to watch for that result. Thank you. That sounds like fun. JANET CONRAD: It is a really neat experiment that these people are doing. IRA FLATOW: All right. We’re going to follow that some more. Janet Conrad, professor of physics at MIT. James Beacham, post-doctoral researcher at Ohio State University. Also part of the Atlas team at CERN joining us from Geneva. Have a great weekend. Thanks for taking time to be with us today. JAMES BEACHAM: Thank you very much.